Enjoy your Outdoor Living like never before, with our full array of products for outdoor kitchens and grills. We offer an extensive collection of some of the best options available in outdoor living supplies, including stainless steel. We even have an indoor showroom displaying some of the products we carry for creating your entertaining space. If you are a contractor or a homeowner, contact us to get set up to buy our outdoor living products. Enjoy your backyard like never before and improve your outdoor entertaining with an Outdoor Living Fireplace from Sauders. Call our sales team or peruse our photos galleries below to get ideas for backyard fireplace designs. We can assist you with the right design for your needs as well as help you find a contractor to install your outdoor fireplace. Are you looking to improve the taste of your patio dining and outdoor cooking experience? As you know, there is nothing quite like steak that is fresh from the grill. Whether you want a Wood Pellet Grill, a Ceramic Grills, an Outdoor Pizza Oven or a full-blown backyard Kitchen with a Grill, we have options. We are happy to help you with determining needed supplies, finding a contractor, or figuring out if a DIY project is right for your outdoor living space. Sauders offers choices for a Patio Fire Pit to fit your tastes for living outdoors. Our fire pit materials are available for contractors as well as for homeowners looking for Do-it-Yourself fire pit packages. 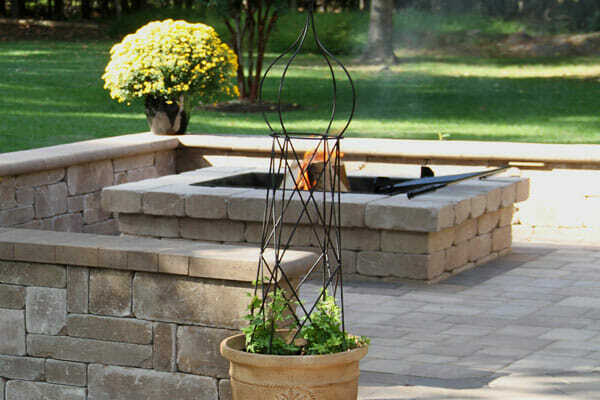 Since we carry an endless amount of options for patio pavers or natural stone, we can work with you or your contractor to design the perfect fire pit for your family’s outdoor living experiences. Remember the last time you were enjoying the warmth of the fire when suddenly the wind changed direction and you were forced to keep moving around the open fire to avoid the burning eyes? With a smokeless fire pit, you can enjoy the warmth without that annoyance in your outdoor living space. Visit our Indoor Hardscape Showroom and you will find inspiring ideas for patios, outdoor kitchens, and even poly furniture. Our Breezesta Poly Furniture will complement your Outdoor Living area and make it a more desirable outdoor space to spend time. Visit our showroom or simply show up and we will happily guide you towards finding the perfect option for your outdoor kitchen and living area. We offer Free Idea Catalogs to folks in PA, DE, and MD. If you are looking for the best ideas in Hardscaping and the support to create a design just for you, start with requesting a Free Catalog!